This is a really fun story. Doug Beyer is a first rate author. The story flow, both action and dialog moved at a great pace. This, along with the preceding two novellas in the series really brought the world of Ravnica to life. Playing Magic the Gathering is made even more interesting with the weaving of story, and this is no exception. I enjoyed the plot. It took some twists and turns that I did not expect, although there were parts that were almost too predictable. The writing was a little more flowery than I like, and the I felt the story could have been told more effectively with fewer words or with more detail. I felt the suspense was over the top and needlessly draw out. I listened to the Audible version. I was not thrilled by the reader, especially the readers male voices. The female voices were good. With all of that said, the story line was very good and enjoyable. In the end, I wanted to know more about what happened to Silo 18. Have you read [insert book title here], someone might ask. If we have listened to the audio version, but not consumed the printed words from the book, we will likely still claim to have ‘read’ the book. Is this accurate? Can we claim to have read a book, even if it the sound waves that represent the words played into our auditory canal without the visual cues of a writing system entering our ocular network for visual processing and decoding? As far back as 1965 when Dune was published, there is a precedent to use the term reading when referring to the consuming of information aside from the traditional decoding of a given writing system. In this future world, “filmclips” and “filmbooks” were the mode of retaining and transmitting information, and yet Frank Herbert did not use the work ‘watch’, which is a passive word. He chose the word “read”, and active act. Listening to music can be actively or passively consumed and enjoyed. Audiobook require active listening in order to truly consume and understand. That is why is ‘read’ audiobooks. 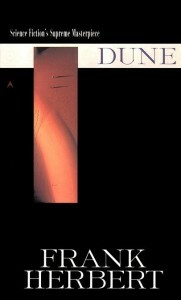 Have you read Dune? Yes. Yes I have. I’ve copied this list of the Top 100 Sci-fi books list from http://scifilists.sffjazz.com/index.html as of July 20, 2012. Since this is a dynamic list that can change based ongoing surveys, I copied it here so I could have a static list from which to work. Regrettably, I can claim to have read only 11 from this list, so I’m starting from the top and working my way down.